Essen has long been associated with the “three rings of Krupp” which symbolized the city’s level of industrialization by the time Allied tanks rolled into the city. Because it had an impressive past as a supplier of steel cannons to the Prussian army and the centre of armaments manufacturing in Germany during WWII, Essen was at the receiving end of relentless blitzkrieg which destroyed an overwhelming chunk of its downtown and suburbs. Coalminers also had a hand in transforming the city’s south into a charming leisure area complete with not-as-damaged half-timbered historic cores of Werden and Kettwig, the former considered one of the oldest cities in all of Germany. 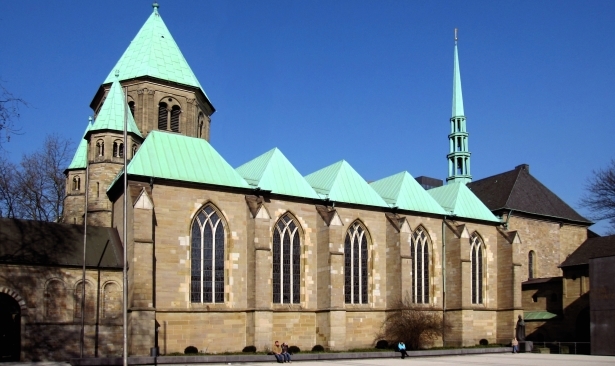 Among modern, glass-façade accommodation in Essen, Germany can be found the 8th century Werden Abbey and St. Ludger’s Basilica which are now part of the Folkwang University of the Arts. Both buildings pre-dated the founding of modern Essen (which grew around the Essen Abbey whose purpose was to serve and educate women of nobility) by almost half a century. The Folkwang Museum, on the other hand, houses artistic outputs from van Gogh, Gauguin, Renoir and Matisse. Then there are treasures in the real sense of the word: the supposed childhood crown of Otto III; the 10th century gem-studded Mathilde Cross; and the priceless 10th century Golden Madonna (which in fact is valued at more than 100 million euros) all housed in the Essener Dom or cathedral treasury. Steel magnate Alfred Krupp (whose ancestors invested in coal mining) was already on the German map as early as 19th century. The wealth he derived from the steel industry is best represented by the lavish Villa Hugel, a 269-room mansion seized by the Allies in 1945 but given back to the heirs of the family who occasionally allow high-profile exhibits in its halls and 28-hectare grounds. Krupp’s estate overlooks the Ruhr river and Baldeney reservoir, the latter a favourite hang-out of locals when the weather gets warm and ideal for watersports like canoeing and sailing. If you’d rather head for the greenery, walk the short distance from your bed and breakfast in Essen, Germany to the Grugapark botanical gardens which entertain visitors of all ages, but particularly those fond of primeval specimens from Australia and Asia. While only a century old, the Old Synagogue is a somber reminder of the Jewish presence in pre-Nazi Essen. But if you were to go further back, as far as Stone Age, you may want to explore the Ruhrlandmuseum which houses geological and archaeological artifacts dug from the northern part of the city.